Welmin Sheep Mineral Supplements provide minerals essential for healthy sheep. Sheep require minerals in order to grow and to produce lambs and wool. Minerals serve many functions within an animal. They are important for bone development, enzyme activation, muscle contractions, regulating acid-base balances and are a component of hormones critical for maintaining the well-being of your sheep. All sheep require minerals, including salt, on a daily basis. Failure to supply adequate amounts of minerals in the diet results in poor fertility, weak lambs at birth, reduced milk production, depressed immunity and numerous metabolic disorders. The quantity of minerals required by your sheep will depend on their age, weight, parasite load and level of production. The more productive your sheep i.e. dairy sheep and prolific breeds, the higher their requirements will be. The Welmin Sheep Mineral Supplements range includes both powder and block minerals. The powder mineral is ideal for supplementing the concentrate feed while the blocks provide convenience outdoors. These include our standard Sheep Block, Sheep Block with 10% magnesium and our high energy FishMeg Sheep Block with 25% fish oil, the ideal energy block for tupping and pre and post lambing. Increase daily live weight gain. Support calf and lamb natural defence mechanism. Welmin Sheep Special is formulated to provide a balance of minerals, vitamins and trace elements and so provide the nutrition needed for peak performance at lambing, lactating and tupping times as well as for growth. A high spec balanced mineral supplying all of the key minerals and vitamins for a healthy flock and strong lambs. Welmin Sheep Special contains a small quantity of chelated copper to aid growth and fertility. Contains high levels of cobalt and complementary vitamin B12 for maximum cobalt uptake. The high levels of vitamin E enhance red meat colour, preventing oxidation during storage which is a major advantage at the butchers counter. Phosphorus included for growth and skeletal soundness. 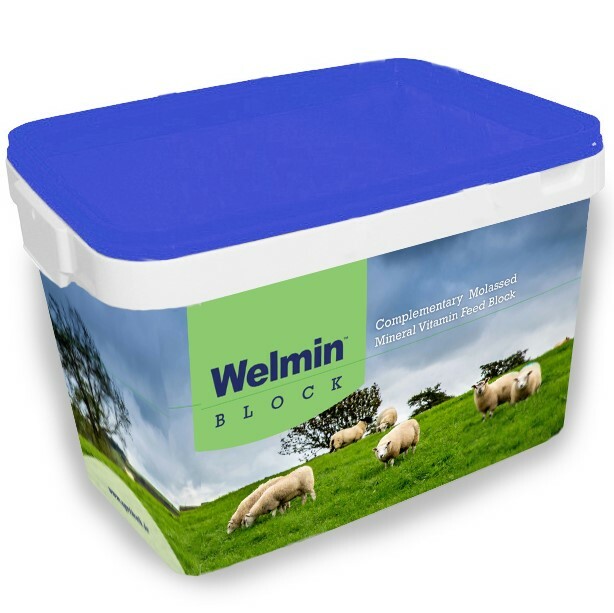 Welmin Sheep Block is the ideal supplement for outdoor or indoor sheep providing all the necessary minerals and vitamins for a healthy flock and strong young lambs. With its highly palatable molasses base it is recommended for use pre and post tupping for optimum fertility rates. Welmin Sheep Block is formulated for the breeding ewe to ensure optimum fertility and strong lambs. Good levels of trace elements especially cobalt and vitamin B12 to prevent pining are essential in order to avoid any unnecessary deficiencies. Sheep have specific demands in terms of energy requirements at different times of the year. Welmin Optimate Omega 3 Sheep block is formulated to supply concentrated energy and protein for the ewe carrying twins or greater and post lambing in terms of milk supply. 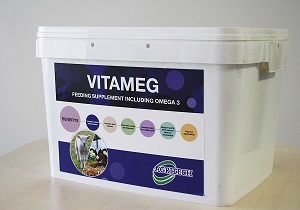 A unique feed block containing high levels of omega 3 salmon oil with protein from multiple sources, NPN from Urea, protected protein from protected soya and extra protein from added yeast. The benefit of fish oil with the high levels of omega 3 essential fatty acids EPA & DHA is to enhance fertility. Excellent boost of extra energy at tupping time. During the winter months when winter fodder is scarce the supply of added energy and protein will help to sustain the animal through harsher climates. To buy our Welmin Sheep Mineral Supplements, contact your local distributor.